The Archbishop of Canterbury has summoned all the primates of the Anglican church to discuss the appointment of gay bishop Gene Robinson in the US. 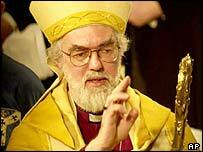 Dr Rowan Williams said the meeting will take place in October in London. He said concern over the decision of the Episcopal church in the US to appoint Mr Robinson as bishop of New Hampshire meant it was time to sit down and talk. "I am clear that the anxieties caused by recent developments have reached the point where we will need to sit down and discuss their consequences," the archbishop said. The move comes after Dr Williams warned of "difficult days" ahead for the Anglican church. In July, gay priest Canon Jeffrey John decided not to take up the position of Bishop of Reading in Berkshire, following weeks of bitter argument over his sexuality within the Anglican Church. Dr Williams said: "It is my hope that the church in America and the rest of the Anglican Communion will have the opportunity to consider this development before significant and irrevocable decisions are made in response." Gene Robinson was elected by 62 votes to 45 by bishops of the Episcopal Church, the US branch of the 80-million strong global Anglican Communion. Robinson's partner of 13 years, Mark Andrew, attended the turbulent confirmation process - which was suspended briefly so church elders could investigate allegations of sexual misconduct, of which he was cleared. Robinson said after his appointment: "I suspect that before too long, other denominations will also follow and welcome openly gay and lesbian people into leadership positions. "Just as Jesus reached out to people on the fringes and brought them in, that's what the Episcopal Church is doing with this vote," he added. Church leaders in Asia and Africa have condemned the appointment and are planning to meet to discuss cutting ties with the US church over the issue. "We cannot be in fellowship with them when they violate the explicit scripture that the Anglican Church subscribes to," said the Very Reverend Peter Karanja, provost of All Saints' Cathedral in Nairobi, Kenya. "Practising homosexuality is culturally and legally not acceptable here," said Bishop Lim Cheng Ean, leader of the Anglican Church of West Malaysia, who added that southeast Asian bishops would be meeting to discuss the issue. Episcopal Church spokesman Daniel England called the vote "an important step". "Some will be elated at this news, others very disappointed," he said. "Yet the decorum and the civility throughout leads me to believe that things will hold together." Fiercest criticism has come from the American Anglican Council, an Episcopal splinter group, which said the Episcopal Church had "departed from the historical Christian faith. We reject these actions of our Church".